Past is the present for UK's Stairway as their fifth release, Interregnum, reveals 80's melodic hard rock and heavy metal. Consider most any NWOBHM band of that era, and you will find remnants of many in this power trio. Combining this style with their obvious Christian lyrics, and you will be transported back to Christian metal's glory days. While neither adding invention or innovation, on Interregnum Stairway revisits and refreshes this seminal genre with skill and enthusiasm. Their strengths are simple: strong melodic arrangements built with a steady rhythm section, lofty vocals, and soaring guitar solos. Again, there's nothing really original here, merely solid melodic metal. Nevertheless, Stairway delivers with precision and vigor. Select cuts include the opener The Suffering Servant and also I'm Calling, Ride the Wind, and What Lies Within. If you dig the classic 80's NWOBHM sound, then Stairway's Interregnum is the real deal. Recommended! 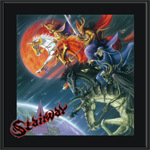 If you dig the classic 80's NWOBHM sound, then Stairway's Interregnum is the real deal. Recommended!